the rating of branded detergents used commonly in India has been completed and it doesn't reflect too well on some brands. voice (Voluntary Organisation in Interest of Consumer Education), a Delhi-based non-governmental organisation, has released the results of a year and a half of painstaking tests and research, rating 14 of the most commonly used brands of detergents. The brands were tested for, besides other things, their biodegradability and phosphate content. The results show some of the brands in bad light and narrate a story of disregard for the environmental imperative by the industry in the absence of strong regulations. The threat to environment from soaps arises from the phosphate added to the detergents. Usually detergent manufacturers add sodium tri-polyphosphate ( stpp ). Phosphates are added to washing powders to soften hard water by binding with the calcium ions in the calcium carbonate (lime stone) that causes the hardness. The phosphates prevent the carbonate from settling on the clothes washed. stpp and other phosphates also help stabilise the alkalinity of the water and the p h value, increasing the action of the surfactants in the detergent. 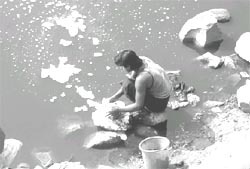 But once the washing is done, the phosphates get washed along with the dirty water into the waterbodies. Phosphorus causes eutrophication in these waterbodies. Usually, with the run off from the catchments, the waterbodies also get their share of nutrients washed off from the topsoil. The gradual increase of nutrients in the waterbodies makes it suitable for the growth of phytoplanktons and at times macrophytes. This is natural eutrophication. But human-induced excess of nutrients cause an accelerated productivity in the waterbodies. The algae content increases in the water and the subsequent death of algal bloom leads to consumption of the oxygen dissolved in water, creating hypoxic, and at times, near anoxic situation. "This excess eutrophication can kill the fish, cause odour and increase pathogenic animals", says N K Kaushik, professor emeritus for environmental biology at the Canadian University of Guelph. It can also make water toxic. Plant growth requires a number of nutrients such as calcium, phosphorus and nitrogen in a particular ratio. A disproportionately less amount of a particular nutrient makes it the limiting factor in plant growth in the waterbodies. In Indian waterbodies, Kaushik says, phosphorus is often the limiting factor. Procedure and results To test which of the Indian brand of detergents are the biggest culprits, voice, went about collecting samples of detergents that were found, on the basis of data collected by the Delhi-based National Council for Applied Economic Research ( ncaer ) and their own primary market surveys, to be the most commonly in use across the country. The samples of the selected products were then sent to the Ahmedabad Textile Industry's Research Association ( atira) for testing under a methodology devised by technical experts of voice . Roopa Vajpayi, honorary editor of voice 's magazine, explains: "We went to experts to help devise the detailed methodology for various tests that we had undertaken. Once the test methodology was ready we sent it to all the companies whose brands had been chosen for testing, to suggest improvements and comment on the tests. A few companies responded." For testing the phosphate content, samples were oxidised by heating with sodium nitrate. Silica was removed and the condensed phosphates were hydrolysed and precipitated. Then by titration with sodium hydroxide, the precipitates washed with potassium nitrates were quantified for phosphate content. The other environmental test conducted was for biodegradability. The test organisms were inoculated into a microbial growth containing the sample to be tested. Carbon dioxide free air was bubbled through the contents and the amount of carbon dioxide produced was estimated. The biodegradability was judged by the amount of carbon dioxide generated by the test material as a percentage of the theoretically possible amount. The tests conducted by voice show that all detergents are not equally to blame (see graph: Heavy load ). Some of the detergent brands tested have very high stpp content, while some manufacturers have been environmentally conscious and kept the phosphate level to the minimum. Three brands, Surf Excel and Ariel Microshine and Surf Wash booster, fare the worst, each containing more than 20 per cent stpp by weight in them. S R Khanna, honorary managing trustee of voice, says, "Quite surprisingly the three brands found to be high on phosphates belong to multinational companies that adhere to much lower limits set by countries like Canada and the us. Kaushik also finds this discriminatory practice by the companies as abrogation of their responsibility. Khanna further adds, "It is not as if these companies, Proctor and Gamble and Hindustan Levers Limited are not aware of the harm phosphate can cause." Debasis Ray, corporate communications manager for Hindustan Lever Limited rebuts the charge and defends the high level of stpp in their brand in India: "The contribution to the overall stpp content in waterbodies from detergents in India is less than one per cent. Removal of phosphates from detergents will have negligible impact on the overall phosphate load in the environment." But Kaushik points out, "The use of phosphates is increasing. It is the limiting factor." A study conducted by Clive Southey, associate professor in the University of Guelph, Canada, shows that the load of phosphate may in fact be between 2.1 per cent and 3.6 per cent and the use of stpp is growing at a fast pace. Kaushik, who has studied the regulations put in place in Canada to control the eutrophication of the great lake system, says in India, the best way of protecting our waterbodies is to put a cap on the amount of stpp that detergents should be allowed and progressively reduce it with time (Detergents threaten Indian waterbodies ). He believes, India cannot afford the massive treatment costs that it may have to foot later. Therefore it would be better to be vigilant now than sorry later. Clean up costs never come cheap and international experience has proven this. A 1996 National Council for Applied Economic Research ( ncaer) study, quoted in a newspaper report says that 55 per cent of all washing powder sales are generated by rural demand, implying that the village-based waterbodies face as much if not greater threat of eutrophication. Given our state of infrastructure to fight environmental degradation, streams, rivers and the ponds in the villages are the ones most unlikely to be undergo any treatment. Such rural woes are rarely highlighted by the media and remain neglected by the government as a result.
" The multinational companies scuttled the 'Ecomark' scheme, introduced in 1991 by the Union ministry of environment and forests, which prescribes against use of phosphates as builders", says Khanna. He accuses them of having opposed the scheme at all points. He as well as Kaushik point out that the 'Ecomark' scheme demands voluntary adherence. Both believe the only way the detergent industry can be made to comply with the norms laid down is by a dialogue between community representatives, the civil society, industry and the government. In fact, they blame the government as much as the industry for washing their hands off the issue.